Triweekly update of the things happening in the world of science, made understandable for everyone. ‘These results provide evidence for a recent ice age on Mars.’ say Isaac Smith and his team in this week’s issue of Science. They have discovered this by using radar. Ice ages are periods of time when the climate is exceptionally cold, and because of that, there’s a lot of ice. The last ice age ended 11.700 years ago. Warmer periods of time separate one ice age from another. We currently live in one of those warmer periods and the next ice age probably starts in around 50.000 years. We don’t really know yet how ice ages exactly happen. But we know it can be caused by changes in the earth orbit, which causes the earth to get less light, so less warmth. So it gets colder. An ice age can also be caused by the sun. If the sun is less active for a while, earth also gets colder. Another major factor is the concentration of carbon dioxide and methane in the atmosphere. More of these gasses create higher temperatures on earth. Anyway, ice ages are also a thing on Mars. Give those little green men a coat! Isaac Smith and his team have discovered with radar techniques evidence for dramatic changes in Mars’ climate. They have found evidence of ice growing in retreating, in the same way you can also see this on earth; small walls made of dirt that was pushed forward by the ice. 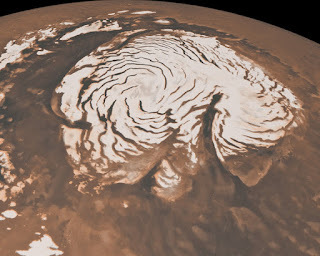 They have also discovered that the amount of ice around the north pole of Mars has grown with 87.000 cubic kilometres in the last 370.000 years, which is enough ice to cover the whole planet with a sixty-centimetre-thick layer of ice. Isaac Smith and his team were further convinced by the facts that Mars shares a lot of earth’s traits that cause ice ages. Mars orbits around the same sun as earth, of course, which is one thing that causes ice ages on both planets, but Mars also sometimes changes its orbit, like earth. The changes in the orbit of Mars are even bigger, since the planet doesn’t have a big moon, like earth does, to keep the planet in check. We can use it here too! With this discovery, we’ve come to know a lot more about how ice ages on Mars work. Which makes it easier to predict the next one. It also gives us more insight in the sun’s influence on ice ages, since we can observe a planet reacting to the sun, but without many earth’s traits. This new knowledge about the sun can help us in predicting our next ice age. And even in how the greenhouse effect is influencing ice ages. Click here to read more astronomy posts. Great that you want to comment! Please write something relevant and non-offending. Congratulations, you're the ... visiter! Don’t let our cities turn into junkyards! Watch out! Paint flake coming in! Kepler is alive again, and uses microlensing!